What’s better than waking up to the sounds of the breeze rustling through the evergreen trees, and the mountains misty in the sunrise? The answer: literally nothing. You can’t find this kind of immersive nature just anywhere, but if you’re headed to the Canadian Rockies, camping in Jasper National Park is one of the best places to experience this surreal feeling. If you love the outdoors and you’re hoping to find the best way to experience the Canadian Rockies, it doesn’t get much better than camping. 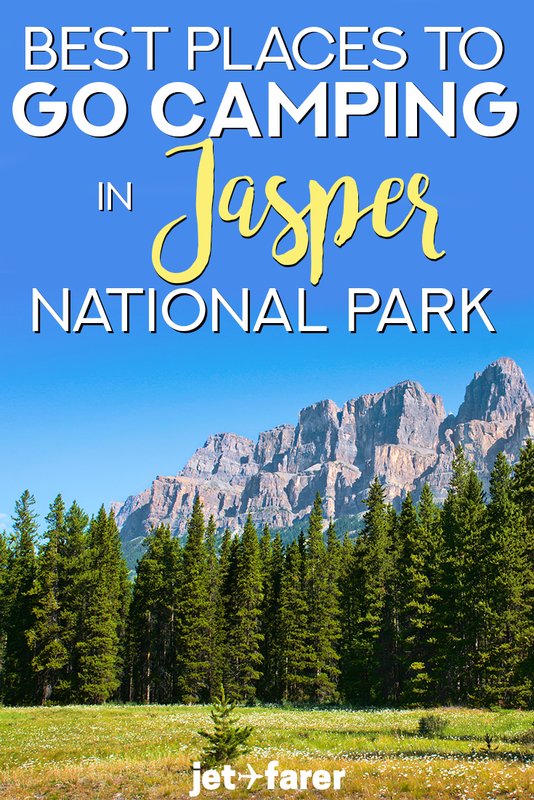 We put together this Jasper National Park camping guide to help you plan an incredible getaway in Jasper. Read on for the good stuff! While the warmest season of the year in Jasper is summer, Jasper is open all year! In my opinion, the best time to hike in Jasper is in the spring or the fall, when the weather is warm enough to stay outside for extended periods of time but the summer crowds have subsided. 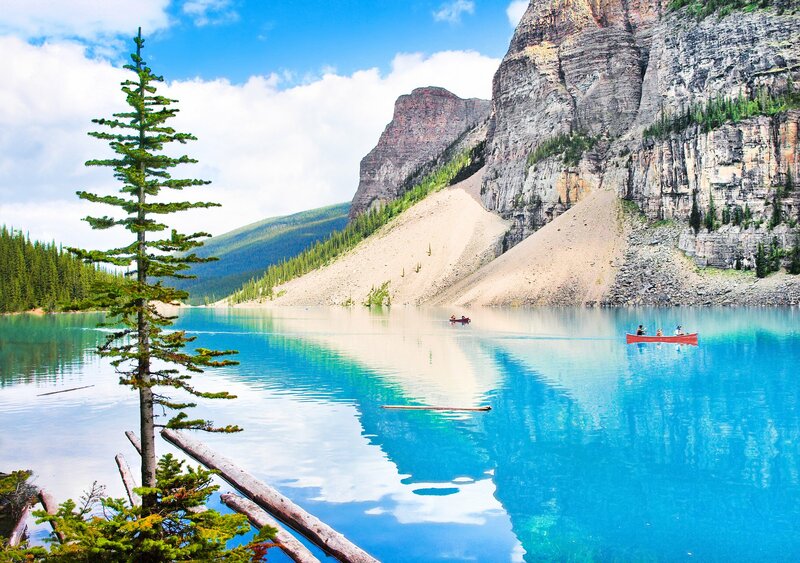 Most of the tourists flock to Banff and Jasper in July and August, so if you want to avoid massive tourist crowds, avoid those months. If you’re visiting in the winter, be sure to check the Parks Canada website so you know which parts of the park are open (and which are shut down for the season). However, you can actually camp in Jasper year-round at certain sites. I wouldn’t recommend doing this in a tent (it gets SO cold there! ), but if you have a campervan or are planning on renting one, you can access some of the campsites in the area all year. I’ll go into this a bit more in-depth later in the post. You’ll most likely begin your trip by flying into Calgary International Airport (YYC). Once you arrive, the best way to get around is by renting a car. At Calgary’s airport, there are tons of car rental agencies you can rent from – I rented from Avis every single time I visited Banff (over 12 times!) and the process was always seamless and easy. You can also rent a car in downtown Calgary or in nearby Edmonton, at the airport or downtown. From Calgary, you will take the Trans-Canada Highway AB-1 going West. The trip takes just over an hour to get to the front entrance of Banff, where you’ll pay the park entrance fees. From there, it’s about 3 and a half hours to Jasper. You’ll pass through the Icefields parkway on your way up. You’ll most likely need a rental car to get around within the park itself. While Banff has buses that can shuttle you to and from the town center, Jasper is a bit more remote and doesn’t offer this. Waterproof hiking boots – While hiking in Jasper, there’s a good chance you’ll be caught walking in mud, snow, and stream crossings. To keep my feet warm and dry during day hikes, I have a cozy pair of Ahnu waterproof hiking boots (men’s version here) that always do the trick! My boots have been with me to Patagonia, Peru, Slovenia, and more, and they’re still kicking (haha, get it?!). Merino wool layers – It’s a really good idea to bring a merino wool baselayer (men’s version here), which will keep you cool in the summer and warm in colder weather. Merino is soft, sturdy, stink-free, and sweat-wicking, AKA the best fabric ever for hikers. We use Smartwool baselayers and love them. A waterproof rain shell – No matter what time of year it is, there’s a decent chance of sudden rain in the Canadian Rockies, even if the skies are blue. Bring a sturdy, waterproof rain jacket (men’s version here) to stay warm and dry while camping in Jasper. A compressible down jacket – Temperatures in Jasper can be chilly even in the summer, especially as you gain altitude in your hikes. For this reason, I always make sure to pack my thermal puffer, all rolled up into a tiny ball that I can shove into the bottom of my day pack. Mosquito repellent, sunscreen, and sunglasses – Duh. Tent – A lightweight, packable tent is a must for Jasper camping. When I go camping in alpine areas, I use a Marmot 2 person tent that I adore. Sleeping bag – Jasper can get seriously cold at night, even in the summer. Be sure to come prepared with a warm sleeping bag for the chilly evenings. I’d recommend also bringing a thermal sleeping bag liner just in case! Thermal sleeping mat – Don’t be an idiot like me and forget to bring a thermal sleeping mat! I have an inflatable sleeping mat from REI that I love. Fire starting materials – Newsflash for beginner campers: it’s hard to start a fire. It’s a lot easier when you have matches, lighter fluid, etc., so don’t forget those things if you plan to use the fire pits. Cooking & cleaning items – If you’re planning to cook, you’ll want a mess kit and some pots and pans. You’ll also need some eco-friendly soap and a scrubber to clean it with. Head lamp – Sometimes the best views are at sunset or sunrise, and you’ll end up needing to hike when it’s a bit dark outside. 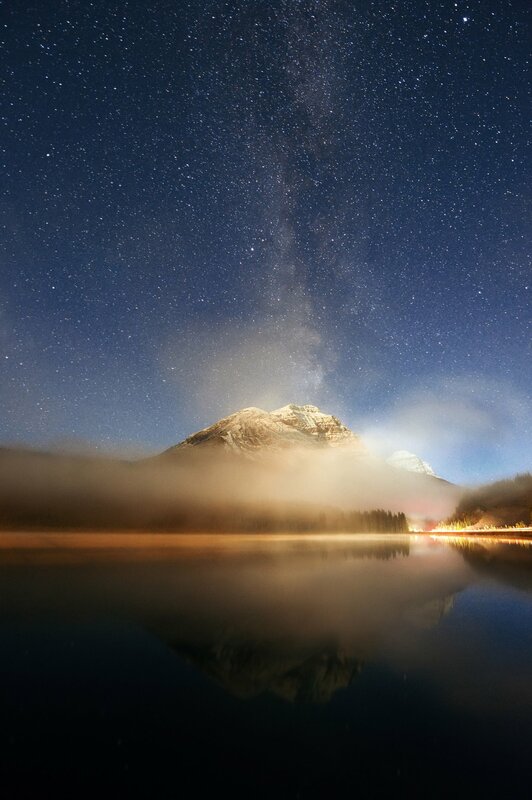 I love my trusty head lamp for hiking in the early morning or late evening. Hammock – Totally optional, but evergreen trees are abundant in Jasper and you may just want to take a little nap with a view… a packable 2-person hammock can help with that. Reusable water bottle and filter – Reminder: you’re in a national park and it’s super important to minimize your plastic consumption. However, clean water is a must, so we always bring water purifiers and a reusable water bottle. I love pairing my rock-solid Hydro Flask with my SteriPen Aqua and Sawyer Products Mini Water Filter for clean, cold water on the go. Bear spray – Do not go camping in Jasper without a can of bear spray. You probably won’t have to use it, but this will help you out in the event of a bear (or other wildlife) sighting. You can get bear spray at any outdoor retailer in Canada, just make sure to leave them behind before you fly home. There’s lots of wildlife all around the park. Bears, mountain goats, elk, wolves… There are these species and more all over Jasper, so it’s important to know what to do in the event of a sighting. Usually, the park rangers at each campsite will be able to tell you what kinds of animals are in the area, but it’s good to plan ahead. Always bring bear spray, avoid hiking alone, do not keep food inside or around your tent, and heed any notices from park rangers. Be sure to reserve your campsites in advance. Jasper’s camping reservations sell out super quickly (especially in the summer), so it’s really important to reserve your campsites as far in advance as possible, especially since Whistlers Campground, Jasper’s largest campground, is closed for the 2019 season. Some of the more popular campsites get completely booked months in advance! You can reserve campsites on the Parks Canada reservations page. Frontcountry camping is well-equipped with all of the amenities you may need. The frontcountry campsites, which we’ll go over in the next section, are usually equipped with bear boxes, bathrooms, electrical hookups, and even showers. Isn’t that luxurious? When you book any of the campgrounds in Jasper, you’ll pay a camping fee, which gives you access to your reserved campsite, a fire pit, and the on-site amenities. You’ll need a special permit for backcountry camping. If you want to go backcountry camping, there are special trails and campsites designated for you and rules you need to abide by. You’ll also need to get a backcountry camping permit at one of the Parks Canada offices. Due to regulations, fire pits usually cost extra to use. If you’re planning on building a fire, note this when you make your reservations or show up to a first-come first-served campsite. Tent camping is the most popular type of camping in Jasper and is really easy to do, as long as you have the right gear! Jasper has 10 frontcountry campsites for tent campers, 4 which you can reserve in advance and 6 that are only first-come, first-served. You can reserve campsites in Jasper here and check fees and pricing for Jasper campsites here. We strongly recommend moving around to a few different campsites during your trip so you can experience many different parts of the park. Here’s a short overview of each of the 9 campsites in Jasper, where they’re located, and what to expect while you’re there. Wapiti is currently Jasper’s largest open campsite, which is situated in a scenic spot next to the Athabasca River. Given its proximity to town, its large number of campsites, and its year-round availability, Wapiti is one of the more popular campsites in Jasper. If you’re planning to go camping in Jasper during the summer months, I strongly recommend reserving Wapiti Campsite in advance. Although there are 363 sites, they can go quickly, especially when the weather is beautiful and it’s prime hiking season. During certain times of the year (or if you arrive when there’s no park ranger), you may need to self-register at the kiosk towards the front of the park. A bit farther south on the Athabasca River from Wapiti lies Wabasso Campground. This medium-sized campsite is just off the Icefields Parkway and has 231 spaces, perfect for any tent or RV campers. Wabasso takes reservations and I strongly recommend booking in advance, especially if you’re planning to camp between June and August. While there aren’t any showers in Wabasso, there are flush toilets and running water, as well as fire pits and electrical hookups. In this campsite, you’ll be a little farther away from Jasper’s town center, but you’ll have better access to the Edith Cavell area hikes and activities, as well as the rest of the Icefields Parkway. If you’re seeking a more tranquil, secluded Jasper National Park camping experience, Pocahontas Campsite is a fantastic option. It’s a really nice contrast to some of the other, more central campsites, and you’ll get more peace and quiet in this smaller campground. As Pocahontas Campground is the smallest campsite that takes reservations, it’s important to reserve ahead of time in order to ensure you’ll get a spot. Located near the Miette Hot Springs, you’ll have fantastic access to the relaxing springs as well as nearby hikes and adventures. I recommend tacking the Sulphur Skyline hike while you’re in the area. Don’t expect anything too luxurious at the campsite, but you will have access to flush toilets, running water, fire pits, and electrical hookups. If you need a hot shower, pop over to the Miette Hot Springs and use theirs (for a small entrance fee!). Whistlers Campground is like the Disneyland of campsites in Jasper. The closest campsite to town, it literally has everything you could possibly need, including hot showers, flush toilets, running water, fire pits, a playground for families, glamping tents, and more. With a trail running through the campground connecting it to Jasper’s town center, visitors can access grocery stores, restaurants, gear shops, etc. easily by foot, car, or bike. If you’re in Jasper with a large group or want a more social camping in Jasper vibe, I’d strongly recommend spending a night or two in Whistlers Campground. It’s scenic, spacious, central…what more could you want? Located on the banks of the Snaring River, the Snaring Campsite is a beautiful, small campsite in Jasper with just 62 spots. There are a wide range of campsites, from woodland shady areas to wide open sunny spots. Get there early and snag a campsite along the river, which have really amazing views of the mountains peeking through the trees. As a first come first served campsite, Snaring Campsite is a wonderful place to go if you couldn’t snag a campsite reservation but want to stay somewhere beautiful and peaceful. Snaring (and the rest of the first come first served campsites) is considered a “primitive” campsite, meaning that you’ll have access to drop toilets, water, and fire/cooking areas, but there aren’t any more “luxurious amenities” like hot showers or electricity. Think of it as a fabulous way to enjoy Jasper’s rugged nature without having to go backcountry camping! Snaring is located about 17 kilometers north of Jasper’s town center, so it’s a bit of a drive to get to and from the main shopping and restaurant area. However, you’ll get great access to the Pyramid Lake area as well as the Snaring River and the Miette Hot Springs. South of the town center is the small, primitive campsite, Kerkeslin Campsite. Here, you’ll find shaded campsites with lots of privacy and tranquility next to the Athabasca River. The campsite is another primitive one, meaning you’ll have basic amenities like drop toilets, running water, and fire pits. It’s a short drive from the town and grants easy access to attractions near Mount Edith Cavell (Angel Glacier, anyone?!) and Geraldine Peak. Additionally, Kerkeslin Campground is situated right on the Icefields Parkway, providing easy road trip access to the Columbia Icefield and onward to Banff. 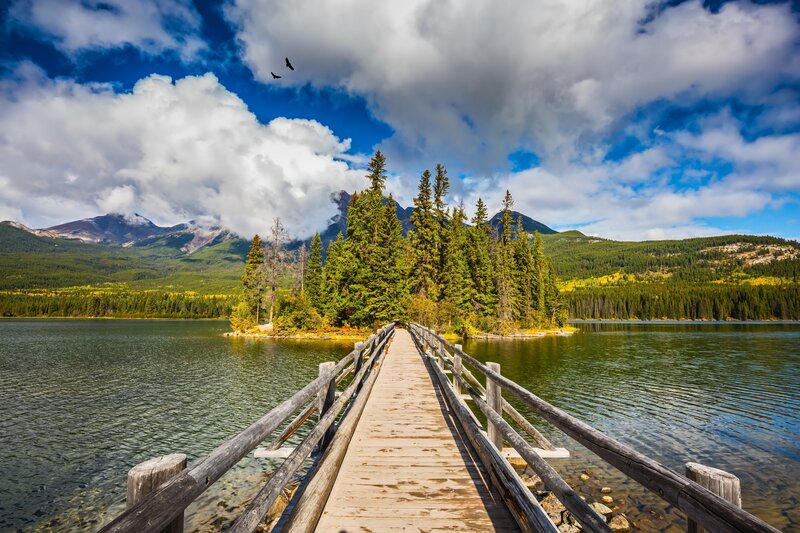 You probably took one look at the name of this campsite and thought, “ooooh, how romantic!” And it’s true, Honeymoon Lake probably is one of the most romantic campsites in Jasper (except for not having any showers…). 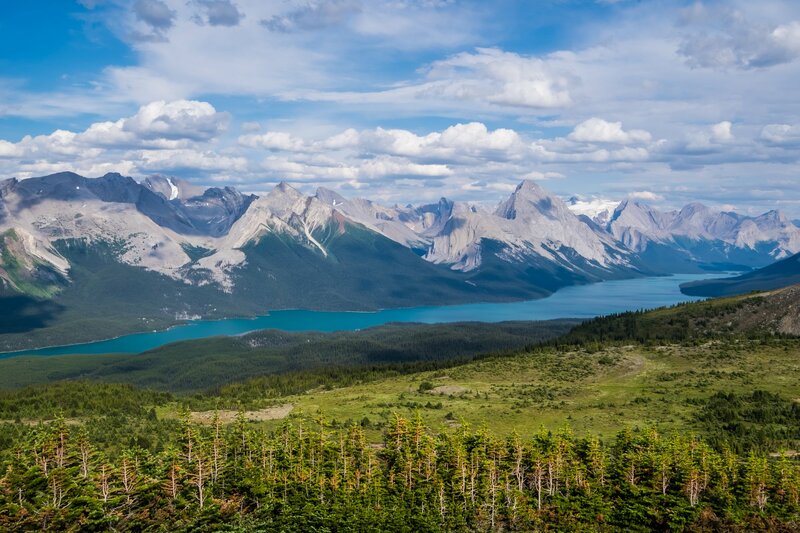 Situated on the Icefields Parkway, around 50 kilometers from Jasper’s town center, what you’ll give up in amenities and cell service, you’ll gain in quiet, secluded beauty. 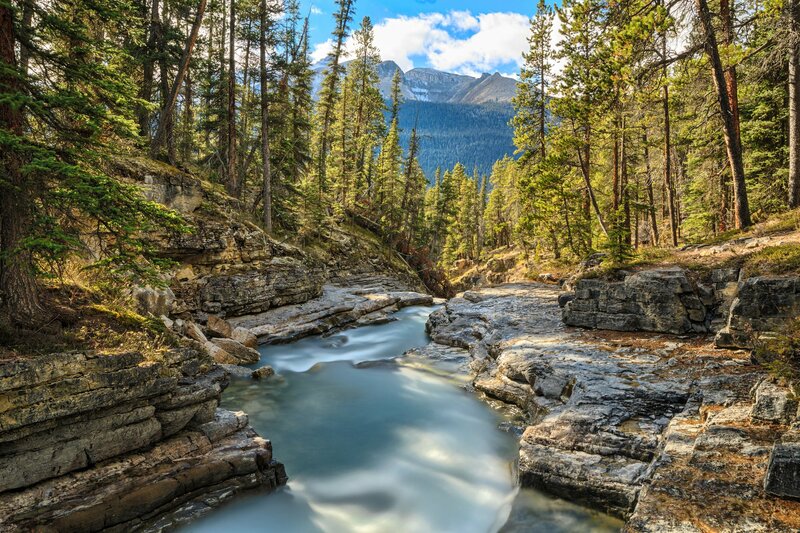 And, as one of the southernmost campsites in Jasper, you’ll not only have fabulous access to the Icefields Parkway, but also to the areas surrounding Sunwapta Falls and River (can we say helllooooo white water rafting?!). As the tiniest place to go camping in Jasper National Park, Jonas campground is a lovely little secluded gem located in the south of the park on the Icefields Parkway. Here, you can find private, spacious campsites in a peaceful forested area, surrounded by trees and a creek. There are also drop toilets, running water, and fire pits available for use. Giving fabulous access to both Jasper National Park and the longer stretches of the Icefields Parkway towards Banff, Jonas Creek is a perfect home away from home for backcountry lovers. If you’re going to try and snag a campsite at ANY of the campsites (in Jasper OR Banff) on the Icefields Parkway, the Icefields Campground should be it. Let’s just say that the views in and around this campground are out of this world, featuring sweeping glaciers, rocky peaks, and breezy evergreen forests. The Icefields Campground is tent-only, meaning it will be extra quiet and secluded. There are only 33 spots here, so if you want to grab a first come, first served spot, you’ll need to plan ahead and get there extra early. When you do manage to get a spot, you’ll have the best access in the Canadian Rockies to the Columbia Icefield and surrounding hikes. The southernmost campsite on our list is the Wilcox Campground, which is just 3 kilometers away from the Icefield Campground. Like the Icefield Campground, it gives really awesome access to the attractions and adventure activities on the Icefields Parkway. Located on the base of a popular day hike in Jasper (Wilcox Pass), there’s a lot of traffic that goes through the area. However, this ALSO means you’ll have the best access to those trails, and trust me, you’ll definitely want to give this day hike a try. 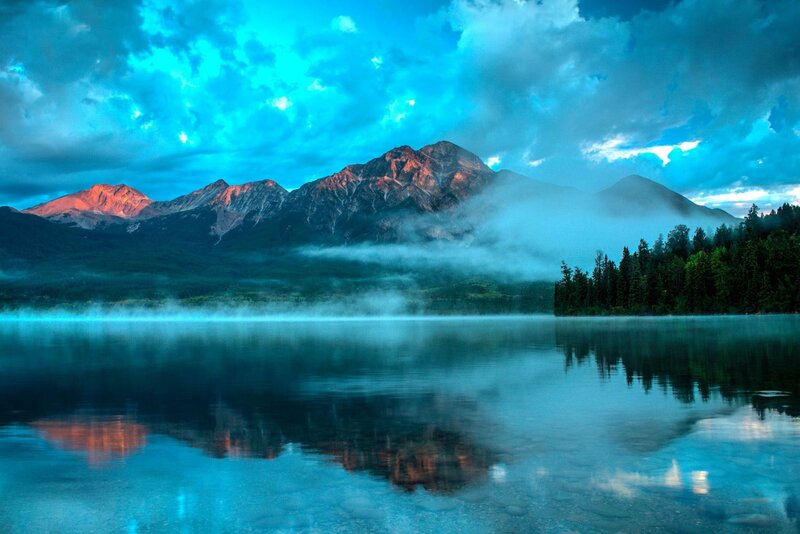 For more intrepid travelers, backcountry hiking and camping is a popular option in Jasper National Park. There are several backcountry trails with primitive campsites suitable for avid hikers. And, you can book them all in advance! Before you go camping in the backcountry areas of Jasper, you will need to purchase and reserve a permit. There are a limited number of permits issued for backcountry campsites in Jasper, so be sure to book it early if you’re planning to do it. You can learn more about permits and purchase yours here. You’ll also need to plan your trekking route before you go, as there are specific designated areas where you are permitted to camp. Luckily, Parks Canada already has several suggestions for hiking routes backcountry camping areas on this page. Before you go, make sure you have all of your necessary camping gear and that you’ve mapped out your route thoroughly.